Is Russia’s only tank producer preparing to sell 49 percent of its shares? 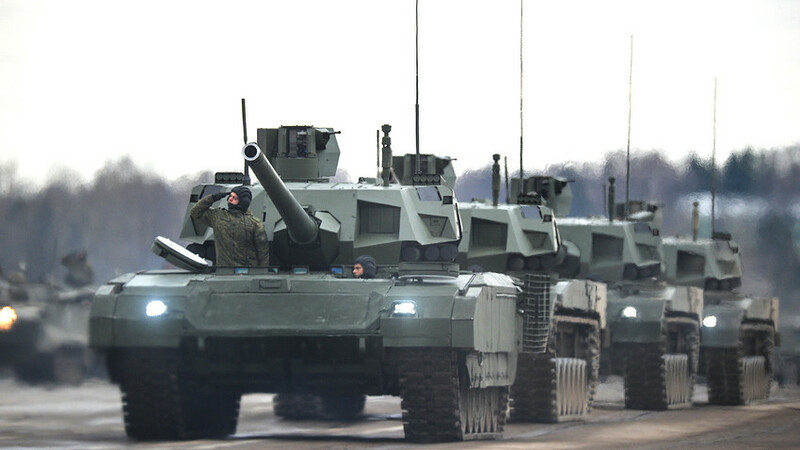 Russian T-14 Armata tanks during a military parade rehearsal. The company, which makes the T-14 Armata war machine, is rumored to be seeking private investors so it can wipe out massive debts. Interfax reported on Jan.8 that Uralvagonzavod - owned by Rostec - might be partially sold to a private investor in the next couple of years. The Russian machine building company makes the country’s finest tank: the T-14 Armata. It’s believed the company is willing to sell up to 49 percent of its stock. Russian arms manufacturer Kalashnikov Concern is rumored to be interested - although they have denied this. Aside from churning out tanks for the military, Uralvagonzavod also makes trains for public transport. “No military units will be sold to foreign investors. But if things go bad the company it will probably divide its military and civilian production and sell the latter the way Sukhoi [a Russian aircraft maker] did. These civilian vehicles could be sold to non-Russian enterprises,” TASS military analyst Viktor Litovkin told Russia Beyond. The privatization of Russia’s sole tank producer was planned in 2016. Back then the company’s management was prepared to sell 25 percent of the company. However, the brakes were put on this idea when President Vladimir Putin signed a decree transferring 100 percent of the company’s shares to the Rostec corporation (which consolidates strategically important companies, many of which are bankrupt or near bankrupt). In March 2017 Uralvagonzavod got a new CEO, Alexander Potapov, the ex-deputy head of Russia’s Industry and Trade Ministry. Following this appointment, the country’s deputy prime minister Dmitry Rogozin told the public that the transfer of Uralvagonzavod to Rostec was done to improve its financial situation and eliminate debt - reported to be $3.5 billion in mid-2016. A military source told Russia Beyond Rostec has not yet chalked off the company’s huge debt, and that an order of T-14 tanks by the army - and the creation of the T-15 Terminator 2 - is set to improve Uralvagonzavod’s fortunes by 2025. “It’s still not enough to put the company back on track,” the source said. “It’s questionable whether or not the company will be able to modernize its factories’ worn-out facilities in order to deliver the T-14 Armata tanks to the military. And if it turns out that the factories can’t cope, the question of shares and financing will come up again,” Litovkin added. So what are these new tanks capable of? Find out here.